What do three CET reference weather stations used by the Met Office have in common? | Watts Up With That? What do three CET reference weather stations used by the Met Office have in common? During the eighteenth and nineteenth centuries, a cool period which coincided with snowy winters and generally cool summers, the temperatures fluctuated widely but with little trend. From 1910, temperatures increased slightly until about 1950 when they flattened before a sharp rising trend began in about 1975. Temperatures in the most recent decade (years 2001-2010) were slightly higher in all seasons than the long-term average. 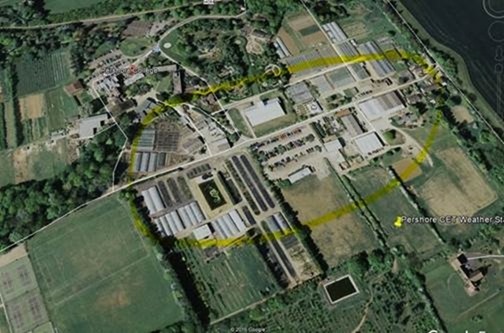 The answer is blindingly obvious, from above: they are all subject to considerable modern local urbanisation immediately to the North, including heated greenhouses designed to replicate a Mediterranean climate. The Met Office has made this adjustment since 1974. Bizarrely, they don’t seem to know exactly why 1974 was chosen other than being able to speculate that “It was probably around then that the effects of urbanisation began to be noticed, although this date as chosen may be slightly arbitrary”. All three weather stations have material modern urbanisation starting within 100 to 200 metres in their Northern quadrant, this development being associated with the rapidly expanding research and educational institutions which control the land on which they are sited. These institutions are often built around old country houses with formal gardens sited to their South in the UK, so their commonality of orientation is unsurprising. 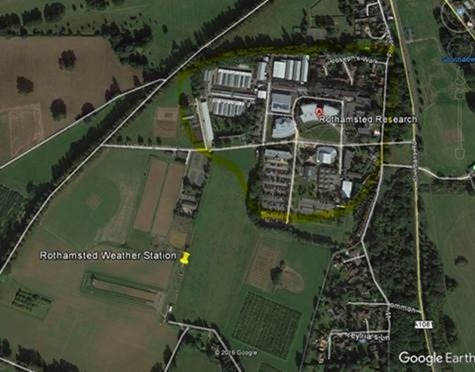 Pershore College has gone a step further and covered the land immediately to the NNW with heated greenhouses https://www.warwickshire.ac.uk/colleges/pershore_college/facilities/pershore_development.aspx , car parks and new building, having a similar effect on the Pershore weather station as its two sister sites. Surely a greenhouse designed to enable “plants to flourish in a semi-Mediterranean climate” sited up wind of a weather station may have some effect? It is not beyond the wit of man to postulate that these localised, specific effects might artificially inflate the recorded temperature. Increasing the data to a temperature not properly compensated for by the small 0.2 degrees C adjustment applied by the Met Office, thereby inflating the CET to a number more amenable to the Met Office and the IPCC. This would particularly warm data recorded in colder temperatures, where winds are more likely to be from the North. “overhaul” its CET datasets during mid-2017. Included in this “overhaul” is a review as “to what adjustments have been made (e.g. urbanisation adjustments, and changes to allow for differing climatological characteristics between the different sites used over the years so as to avoid introducing any inhomogeneities)”. Not before time. The CET problem, from a birds eye view, is staring the Met Office in the face. Met Office EIR Response dated 23 January, 2017. January 29, 2017 in Climate data, Land use land cover change, Weather_stations. In fairness to the MET Office, the problem is fairly obvious. But that doesn’t help. What is the MET Office meant to do about adjusting for UHI? It can’t just say that measuring temperature is beyond them. That’s a large part if what it’s for. And if they put out the honest error bars then the trend in the 20th century becomes insignificant. Which is pretty close to saying that measuring temperature is beyond them… for policy purposes. No UHI adjustment is not as bad as adjusting now urban formerly rural stations hotter rather than cooler, as is US practice. We only learned that once the secret algore-ithms were dragged kicking and screaming out of NOAA and NASA thanks to FOIAing their posteriors. I live in a what is considered a rural US town. Just 6,000 people in the 2010 census, up from 1,000 in the 1900 census. On very cold mornings in the winter it sometimes is 12 degrees Fahrenheit warmer in town than just one mile away outside of town. That’s some serious UHI for a tiny town of just 6,000 people. But that UHI is not a constant 12 degrees F, other days I see 10 degrees, 5, 2, or 0. How does one adjust for that correctly? The best method is no adjustments at all. Use only the best sites, which have always been rural and well situated and maintained. Since your town hasn’t grown much, its UHI effect might be limited, except that now it has heating and cooling systems and cars that it didn’t in 1900. NOAA also had to be pressured to release their book cooking algore-ithms. It’s fairly obvious. Don’t adjust for UHI because any such adjustment is just a guess and introduces political biases. Move the measurement equipment so it isn’t affected by UHI. How about leaving the original station where it is, and then place a new station that is sited better. Then the two sites could be studied in order to reach a better understanding of UHI. That would be highly informative, imo. Goldminor, that is the best answer, as long as they keep to the same elevation it would provide good data. But everybody knows there are degrees of UHI (pun intended) just by listening to any weather forecast. As Jared says it varies, I would suggest depending mostly on the wind strength, but like all things to do with climate measurement you can only deal in max, mins & averages. As AC Osborne says – a very good answer. It would be nice to have more sites, located clear of any current [or known future] UHI. Perhaps seven. But a long overlap, to gain the most we can from the re-siting. On another note, and referencing Pershore’s greenhouses; heating them is expensive, so I assume that they will have some insulations designed to cut heat out-pouring. They will still be warmer than their environs, certainly. Perhaps we should ask what Gordon Manley did to constructed the original record up to 1973. It was a complex homogenization that included the use of records outside central England. From what Tony Barr says, the adjustments since Manley retirement have been remarkably simple. If Manley were still alive, I am sure he could have introduced a similar process to adjust for UHI. It is one thing to ask whether Manley’s homogenization worked, but what this post suggests is that the line after 1973 is a different thing altogether. The MET Office response to the question of Why 1974? suggests that at least that staffer has no idea about the construction of the graph. Of course, there are other ramifications to the contention of the post-1973 record: the magnitude of the modern warming can be directly compared with Lamb’s extension back the other way to 1000 AD with it impressive medieval warming. This is that famous graph use in IPCC FAR and which many sceptics (eg Tim Ball) put forward as a fair schematic for the generalized (global?) trend. I spoke at length with Hubert Lamb about Manley’s work. Lamb knew Manley quite well and they discussed historic temperatures a great deal. My questions were many, including how Manley adjusted or dealt with the myriad site problems, varying times of observation, and different instruments each with there own inconsistencies. There were also the problems of linking together records of varying lengths from some distance apart. Lamb told me Manley did not disclose much detail to him and, as those have read the papers know, he is not very forthcoming in them either – hence my questions to Lamb. We concluded that Manley’s work was valuable in that it confronted the problems of homogenizing a number of records of different lengths from different locations and provided a general pattern of temperature change over time in the area of central England. In broad general terms it appeared to suggest a relative homogeneity in the trends. It appeared that Manley applied as much vigour as possible under the circumstances but failed to disclose most of what he did. These are not criticisms of Manley because his work was pioneering in so many ways and therfore without the knowledge and experience of others. His work and Lambs explanations helped me considerably in my historic reconstructions. Personally, I consider the CET as an interesting record, but lacking the reliability and consistencies required to be considered scientific. Of course, the bizarre situation is that under the IPCC rule of one station having a 1200 km radius applicability, you only need one of the stations to cover the multitude of limitations. Manley’s work at least shows the fallacy of that claim. As in all things weather and climate they have regressed since Manley. Tim, yes 1200Km, about 700+ miles, so the weather in Landsend is supposedly the same as John O Groats (603 miles), what utter stupidity. Why only 0.2 degrees C for UHI? Look at any BBC Weather Forecast and there are temperature forecast figures on the Forecast Charts representing forecast temperatures at each location throughout the UK. Then the weatherman says: but in rural areas temperatures will be 1-2 degrees C cooler. Yet they are using the same weather stations, with this crude average “adjustment” for UHI to provide temperature data for their computer models and long range climate projections, where they are saying a general temperature increase of only 0.15 degrees centigrade per decade (2 degrees centigrade rise by 2100) will occur given current CO2 rises and even that is after massive reductions from past forecasts of the sensitivity, i.e. the temperature rise for doubling of CO2 levels made to make the models fit what is recorded. Then somehow determine and deduct temperature rises due to the man made non-CO2 inputs, and the very many natural phenomena which act generate CO2 or otherwise affect temperatures. Then and only then can you plot a man-made CO2 driven temperature rise v. temperature rise as needed for the forecast future temperatures. With this will come error bands as wide as the graph paper it’s plotted on or, at least, far wider than the forecast future temperature rise! And we are preached at and pressurised continuously to cut CO2 levels, disregarding the known benefits, and forced to pay out £billions in additional Energy costs resulting from their Green Energy dogma and religion based on the above “data” and “science”! An investment analysis out of the nursery and the economics of the madhouse! I thought they were always at airports now. The MEP office usually tell us that the temperature was taken from near Heathrow !!!!! The quick answer is definitely. A) The glass panels reflect light. B) Greenhouses are kept to certain temperatures during nights and all day during winter/fall/spring. Surely a quick comparison to the nearest un-affected recording station should show up as good as a usable approximate correction figure? Is there anything nearby that could be used to give us a clue? Interesting post. Only way to know what adjustments are appropriate woild be another site in the same region without these developments. IF there is one. Certainly the uncertainty/error needs to be widened. Perhaps at least trendwise a narrow aperture UAH/RSS might hint at corrections. 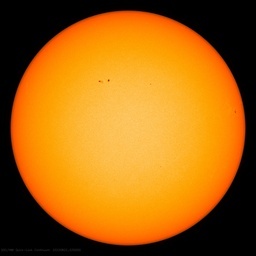 The whole surface record is not fit for climate purpose. Site problems. Then large areas with no data like central Africa. Then no reliable untrade route biased SST until ARGO. there was a WUWT post years ago about a method that is used to adjust data. you take a temp station. you look for two nearby stations. you adjust the first upward. you have now “corrected” the temperature of that first station. this is a mix of empiricism and a reasonable approach for addressing suspected error. now, to make the planet warming, you just need to find a bunch of temp stations where two nearby stations have had temp trends rising more than that one. That is nothing like what they do. There are about 15000 stations world wide with no built up area and no population within 10km of the site. Africa is well covered as well. And as you know because I have told you and because might expect it intuitively, the further the remote stations are from the hand of man, the poorer the data quality. I did this, you will recall, for some 40 remote ‘pristine’ sites in sparsely populated Australia. 40 years of post-1975 daily data crunched for Tmax and Tmin. I have posted the spreadsheets on public blogs many times, but never once had a significant, scientific inquiry back. Maybe it is close to truth and truth hurts, so look away??? The outcome was that noise was too severe to allow useful deductions for om this search about UHI. As a little joke I correlated site temperature linear trends against some other variables like lat and long, even got a reasonable correlation with World Meteorological Number for the stations. How many other tests are needed to show that the historic land records are unfit for homogenisation, unfit for model input, unfit for informing public policy and unfit to be claimed as scientific evidence of much more than noise? What more can I do? Claim that HRC agreed with me in pillow talk? Possibly the HRC aside was – ummm – below the belt, but the fact remains that so many data items, although generally made by well-intentioned folk, trying the best they can with good [for the time] instruments, are not up to modern standards of accuracy. I did it as Officer of the Watch on sea-going ships; full Voluntary Observing Ships. I have got most of our Fleet contributing, too, now. But I am aware of the limitations . . . . . . . . There is data. Probably of modest to low value. That said, where one person, one instrument has given data over – say – 10 years, although 20, or 30 would be better, that place does have something – a trend. If they exist, take several in an area [London. Lancashire. France. Africa. Whatever.] and see if – with error bands – a more widespread trend can be discerned. And – if you have a tame statistician – whether it is statistically significant. The original data should not be thrown away. Any ‘results’ need to explained. And any adjustments need to be very fully documented. This, I am sure, is Meteorology and Climate 101 for most of the readers of this v. special site. But, possibly, it needs saying. The author mentions that the coldest Northerly winds are likely to be most affected, but the prevailing winds in this part of the world are South-westerly. Thus the heating effect may be less than feared for most days ? Harold,hus the heating effect may be less than feared for most days ? Take a wag at what days they will use? The met office are very helpful. I have met with David parker there who compiled Hadley CET to 1772 following on from manleys work to 1660. He subsequently sent me a variety of PDF’s regarding the location of the stations. I also met with Richard betts and have looked at Records in both the library and archives. Ringway was the most obviously affected station beyond the 0.2 allowed for by the met office. I suspect that a substantially greater amount should therefore have been allowed for and this may have lowered the peak we saw in cet at the turn of the century. Hubert lamb once said about historic reconstructions that ‘we can understand the tendency but not the precision’ in other words it allows us to see the general trend but we should not expect to be able to parse temperatures to fractions of a degree. Britain is a lot bigger than NY State. It’s between Kansas and Nebraska in size. You might be thinking of England. But without Wales, England is smaller than NY. Closer to Louisiana or Mississippi. Ringway does not appear in the modern CET it seems, post a 1989 study that identified the UHI. I am no expert, but even to the layman used to seeing the outside temp recorded by his car fall quite a few degrees immediately he leaves town into the sticks, a 1/5 of a degree UHI haircut constantly applied since 1974 appears inadequate in the extreme. Many [most?] cars now have the ‘outside’ temperature facility. So when people notice a two, three, four – or more – degree difference [F or C] between ‘town’ and ‘country’, and there is a ‘haircut’ of 0.2 – folk will laugh. The less well intentioned will explain that it is all part of the great watermelon con. The objection to UHI is that temperatures measured there are not representative of the region. Not that it represents deviation from some ideal state of nature. It seems to me that CET may in fact be representative of the region, UHI and all. You can only measure what is. So get rid of glacial rebound adjustments, Nick. or heaven forbid use raw data? This comment is not like you at all. I take the point that the distribution of stations is neither random or uniform, and thus may provide a net bias towards urban areas, so that some station temperatures may need to be adjusted down to remove this bias. But am I the only one here thinking that at the end of the day, any contribution of the UHI effect is in fact another direct forcing (small though it may be in terms of the overall climate)? Most of earth is not urbanized, yet a hugely disparate portion of stations are in areas that have urbanized since AD 1850. The oceans, polar regions and much of the rural and even urban tropical and temperate zones are poorly sampled or have badly sited and functioning stations. Thus UHI and other land use change adjustments are needed meaningfully to compare 2017 with 1850. Unless you use only rural stations which haven’t moved and have good continuous records. As an aside on the time series given by the Met Office Hadley Centre, the yearly average calculated from the monthly data appears to have consistently small positive bias. The worst error is 1947 (Quoted is 0.075 higher than calculated). The average yearly error over the entire time series in +0.03C. I leave it to the reader to check this themselves, and to understand why the supplied data set has a small annual positive bias on the yearly total. I get the numbers you calculated when I take a simple average of the 12 numbers in each series (i.e. add twelve numbers and divide by twelve). But all of these are not weighted the same due to varying number of days in the respective months. Taking the sum of the products of monthly average x number of days, then dividing by 365 yields the CET averages shown in your post. I believe you are not weighting each monthly value appropriately. More months in the summer with 31 days is where the “small annual positive bias” comes from relative to your calculations, I believe. Well, now that I did that math, I can see Woobblog, already said basically the same thing below. Should have read ahead a bit before posting, sorry the the duplicate. It looks that they calculated the average annual temp by correcting for the numbers of days in the month, rather than treating the months as equal for averaging purposes. This would give a wight for 31 day months as .0.08493150685 vs a weight for Feb (non Leap year) as 0.07671232877. Using 1659 as an example, their average accords with this. And who says that there isn’t a greenhouse effect in Britain?? The worst error is 1947 (Quoted is 0.075 higher than calculated). The average yearly error over the entire time series is +0.03C. I leave it to the reader to check this themselves, and to understand why the supplied data set has a small annual positive bias on the yearly average. Pretty simple. You averaged the mean of monthly figures, not accounting that different months have different number of days, so the correct annual mean is to average all 365 days, not average out the mean of 12 monthly numbers. If you do that you come to exactly the Met Office number. No conspiracy here! The small positive bias being obviously due to February being the shortest, but one of the coldest, months. February 1947 was a record cold month, that’s why the effect is pronounced. It’s should be OBVIOUS to all that all across the world the ground temperature record has been fully corrupted by the urban heat effect, making that record completely worthless. Add to that the disappearing rural stations, and the constant data manipulations that with rare exception always cools the past or warms the present. I think results were affected, but it’s a bit over the top to say that UHE made all observations worthless. maybe thats a bit of catastrophisation from the sceptic camp? Its OBVIOUS to all Gareth. Except Mc Clod, of course. Nothing is obvious to McClod unless it supports the AGW meme. As I indicate above, answering an earlier post, but before reading down to your post, there is data. It may not be precise. But it may have some modest value. Here’s another UK weather phenomenon. 3/4 of a million snowflakes have signed a petition in the last 12 hours to ban Trump from the UK until he stops his bans on refugees and Muslims. Looks like a blizzard approaching. Parliament are obliged to debate this. Prince Charles will not meet with Trump, neither will many senior politicians. I believe that the signatories – who obviously didn’t follow the US Presidential Election, and so completely missed Candidate Trump’s proposals/pledges/promises, which he is now following up on, as per . . . . – are approaching 1.5 million. About 6-7% are from outside the UK [although may still be British, of course]. BBC leads on this on the Internet, with ‘thousands join anti-Trump protests’, of course. Meanwhile, some important news is that ‘The Future of Gin is safe’. Back in the ‘old days ‘ before settled science weather stations with such problems where accepted as in the end weather prediction was a bit ‘hit and miss ‘ therefore such problems did not really matter , the same reason that airport weather sites where used a despite then where intend to provide information for aircraft movements at the airfield ,which can be very different to the surrounding area , and not to be used for a much wider area . Even now with all computing power they can throw at it , the situation remains that they cannot give a weather forecast worth a dam for more then 72 hours ahead to any better level than ‘in summer it is hotter than in winter’ think abut the next time they claim they ‘know ‘ what the temperature will be 50 years ahead to two decimal places . I dio not see it. The locations in those pictures look marvellous compared to Mr Watts American survey. Agreed that that there are more extreme individual examples to be found (such as air con units exhausting over a weather station), but we are talking about the ENTIRITY of the modern CET locations here; all three of them. 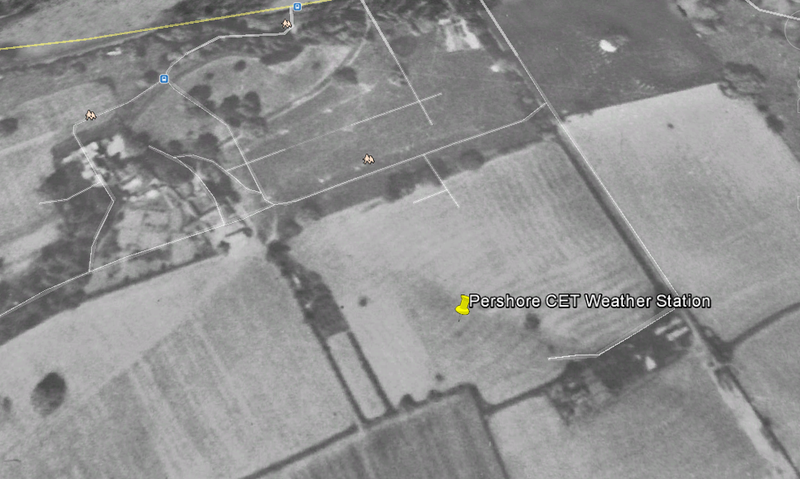 Check out the 1945 aerial for Pershore: 52° 6’0.09″N; 2° 3’35.88″W. No greenhouses, hardly anything – other than a single partially heated house located 350 metres away. So they actually believe that UHI is a constant and they apply it uniformly after 1974? They actually believe that they’re has been no increase in UHI since then??? What’s the British term for bonkers? “They” are so stupid because we are so on top of this. So the UHI adjustments are on a sliding scale, based on increasing urbanisation. They may be due an update, but based on the aerial photographs above, it seems unlikely that the current -0.2C will change much. Recommend they use Satellites for large areas, these are likely fine for locals…People who are really interested in precision have in their homes their own thermometers as they know temps can be quite different just a few KM away.. The Met Office averages these three temperatures and makes a 0.2 degrees C negative adjustment to compensate for the UHI effect. The UHI effect is real heat, and part of the true temperature record. The way I see it, any adjustment to it is no different than NASA adjusting the past. My air conditioning unit senses and displays the temp at a central spot in my home. That spot is fairly representative of my home. If I put thermometers at every window, only, those would poorly reflect the general temp in my home. But the window-located temp stations could easily be read from the outside. Anybody that thinks it appropriate to change the data to correct a bad measurement instead of fixing the measurement system needs to have responsibility for taking measurements removed from them and given to somebody competent. (2) That a 1-off UHI of -0,2 C is applied from 1974 onwards to all three. CET is touted as the most reliable long-term record in the world, and one that I have taken as largely unchallengeable. This can’t be right? Did I miss something? It is right, and it is certainly challengeable. Like almost everything else in “climate science”, it has become ideologically motivated garbage pretending to be science. CET derives from more than 3 stations. Obviously. This article claims that UHI adjustments to the CRT for UHI derive from only 3 stations. Don’t know if that is true but it is plausible. The 3 stations are around the edge of the area covered by the CET. No, you didn’t miss anything; The Modern CET is derived so, and that’s the adjustment made, according to the MET Office, as I understand it, in my ignorance. References are in the piece. Yeah, I know. You can’t make this sh*t up. While I am on, please may I extend apologies on behalf of the British Nation for the idiocy of our Prince Charles. Not his fault – I blame inbreeding, sycophancy and free flowing taxpayer funds. Sorry. Sorry. Sorry. The pompous, puffed-up, jug-eared ignoramus buffon is a walking argument for republicanism. Just finished an article on 18th century biology. Apology accepted for your Clown Prince. Our apologies for 8 years of Obummer. And yours accepted graciously too, albeit I would like to unreservedly thank Mr. Obama from the bottom of heart for arrogantly talking down to us about the desirability of the EU; this undoubtedly swung the Brexit vote the right way. Yes, his UK Beexit intervention was a particularly painful and embarassing episode for us Yanks. I do have an interest in this and I’ve been trying to figure out a few things which don’t quite add up, relating to the biological record. Maybe if I hadn’t taken CET as gospel. all would be clearer. Stonyhurst may be the least changed, but even there, there is some development over the CET record. What we can say for certain is that its energy use will have changed out of all recognition since the CET inception, which is bound to affect its surroundings. Agreed: Pershore was effectively a greenfield site and is now covered in hot houses, and Rothamsted now has numerous very modern buildings despite a long history. It beggars belief that so much money is spent on weather data gathering and climate modelling, and yet when it comes to compensating for a known cause of inaccuracy, a figure appears to be conjured out of thin air and then applied in blanket fashion to readings from a number of widely located data sources. The compensation is applied crudely. It acknowledges the cause (urban encroachment), but it is deemed sufficient to apply it to all locations equally, and in a step fashion, whereas experience would suggest that the effect would increase over time at rates which will be both variable in each location, and differing between locations. Furthermore, there is plenty of anecdotal evidence that UHI effects can be whole numbers of degrees – heavens, over the last week even the BBC has been telling me on every weather forecast that temperatures in the contryside will be degrees lower than in towns. This cavalier approach to temperature corrections makes a mockery of the claims that there is clear evidence of a warming world. Yep, and those multiple integer digit urban/countryside difference figures on the BBC will be derived (for now) from the same Met Office that pretends a 0.2 degree adjustment does the job for the CET. No, you can’t make this up. Yet such is the infantile state of “climate science” on which trillions in treasure have been squandered and billions of lives put at risk. Wladimir Köppen, in 1884, proposed using vegetation boundaries (ecotones) to map climates. That made good sense but was very difficult given the lack of SUVs and satellites. Now that both things are available, climate researchers should return to the better way. Stoneyhurst is a new addition to the CET temperature record. It replaced Squires Gate and Ringway, because these sites had some – errr – reliability issues. Squires Gate is actually Blackpool airport, while Ringway is a hard stand next to the jet-engine testing bays in the middle of Manchester International Airport. So about ten or so years ago, these sites were closed and the monitoring moved to Stoneyhurst. Now this was a good idea, because Stoneyhurst has the longest continuous temperature record in the world. But what did they do to the CET dataset? Did they ditch the previous Squires-Gate-Ringway dataset, and use all the Stoneyhurst data. Or did they just merge the newer Stoneyhurst data (2005 onwards) onto the previous Squires-Gate-Ringway data? I did ask, but did not get a reply. And this does make a difference. For the CET to claim itself to be the longest (and most reliable) temperature record, they should really have remade the entire dataset using Stonehurst data. So it really is worse than we thought. Need to keep the grant monies flowing. Ahhhh . . . . Ohhhh . . ?? We live in interesting – and possibly uncomfortable – times. If the CET record is significantly contaminated by UHI it must be possible to find a temperature record some place – either within the CE region itself or else nearby which contradicts the recent CET trend. I haven’t managed to find one yet and I know the region pretty well. For example, the Valentia Observatory is in a remote location off the south west coast of Ireland. The decadal trends over the last century of CET and Valentia are within a couple of hundredths of a degree of each other..
Has anyone tried checking the trend against satellite data? Select only coordinates above the area in interest and then compare the trend. If they are comparable then UHI is probably not a major problem. When I was investigating this I discounted this location as it appears to be incorrect. Why not just use the Climate Reference Network for temperature records instead of the old, ad-hoc weather stations? Because the CNR is a US weather station network, not UK. Re the top post, who considers CET a ‘benchmark’? And a benchmark for what? Experiment is still the most robust way to validate something. In this case an experiment could be conducted to establish any urban influence with reasonable accuracy. Mount (say) 10 accurate thermometers within a logical perimeter of the devise being tested where urban influence is less obvious. They are establishing regional mean temperature plus highs and lows. So, spacing could be as far as 20 km. One year’s records may be enough to establish any difference. Three-five years would be better. It would also be possible to study the site history to try to duplicate the pre-development conditions .i e. set up the test apparatus in sites similar to that which dominated the historical record. This ain’t rocket science and need not be that expensive. They aren’t blocked, they are held for approval as a first time commenter. If we didn’t have such a safeguard, we’d have all people abusing the privilege to comment. It makes me wonder what the scientists from the 1700’s and 1800’s that were diligently recording these temperatures would think about ‘climate science’ and its political fallout. The old-timers were doing their best – “diligently recording these temperatures”. You start by installing a weather station north of each site and seeing if the temperature difference is significant. If so, that is your compensation value. As someone who lives close to Stonyhurst it made me smile to see Tom refer to “…modern urbanisation…” when referring to the College. The majority of the College buildings have been around since the early 1800’s and are possibly some of the most striking school buildings in England. Although there has been some building works recently at the College (the Refectory and Weld House notably) they are on the North and North West side of the College. I assume that, if the College buildings have an effect on temperature readings, this would have been constant since the 19th century. The College also sits in the shadow of Longridge Fell to the North which shelters it, to an extent, from northerly winds. There isn’t much development close to the College with most of the surrounding area being farmland. 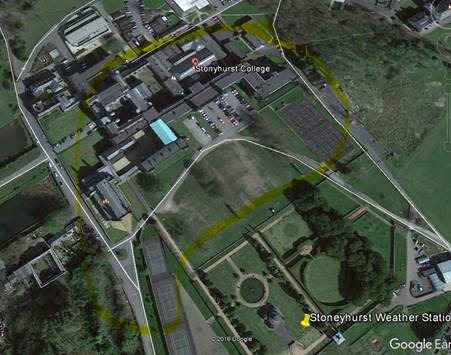 You are right, Stoneyhurst college is virtually unchanged since 1894 – I checked on a site called “Old-maps” which has large scale Ordnance Survey maps going back to the late 19th Century. About the only thing that would have changed in the last 120 years or so is the size of the trees you can see in the picture. Just a small point, I thought one point of a Stevenson Screen was to protect the thermometer from the wind, so it eliminated wind chill from the reading. In that case this seems like a very good location for the weather station. Sheltered, rural garden location unchanged for probably 200 years or so. Apparently the readings are taken by the school’s Classics master in his spare time. Nice to see a continuation of the “Gentleman amateur” tradition. I bet they heat the school buildings better now. Even catholics are no longer so keen on mortification of the flesh. The school is 580 ft roughly downwind (prevailing from SW) of the observatory and the thermometer is behind a Stevenson Screen. The pictures (and map contours) I have seen suggest that the observatory is behind a 6-9 foot rise in the ground between it and the school buildings, so there may not even be line of sight to the school. In which case there can be no convective or radiative impact from a slightly warmer school on the thermometer. Not much to worry about here. That is, of course, provided they are using the full temperature history from the site in compiling the CET. Hopefully they are not stitching the recent figures on to the historic figures from the site it replaced. The Pershore site seems to have much bigger issues. As per Ralph above, Stoneyhurst College is a recent replacement for two egregiously terrible sites. As I said, there is no problem provided it is a full substitution and they are using the all the records from the Stonyhurst site and putting the records from the “egregiously terrible” sites in the trash. So the Met’s 1974 adjustment is way too small. A better adjustment could be calculated for each station. Tiny Lebanon, KS, closest town to the geographic center of the contiguous 48 United States, has experienced no global warming during the interval of rising CO2 since the end of WWII. Record high of 117.0° on July 24, 1936. August was also warmest that year. Only record highs for other months during the supposed late 20th and early 21st century warming interval were in Apr 1989, Jan 1990 and June 2012. Record low of -32.1° on February 12, 1899, but also monthly low records for six other months since 1948, to include 1979, 1984, 1989 and 1997. This is a Met office paper on urban heat, temps and CET related issues. Seems to me they are well aware of any influence on their data. We also know that the Berkley Earth project examined thosands of surface temp measurements to see if urban heat was biasing results. They concluded that no, it wasn’t. If you seriously imagine that urbanization has had no effect on central England since 1850, then you’ve never been there or even studied the history of industrialization. The population of Birmingham in 1851 was 232,638. In 2011, it was 1,074,300, who used a lot more energy each. But then a commenter so paleoclimatologically ill-informed as to imagine that Arctic sea ice has never been lower than now since the Eemian will fall for any lie. But then a commenter so paleoclimatologically ill-informed as to imagine that Arctic sea ice has never been lower than now since the Eemian will fall for any old carp spewed from a watermelon believer’s tonsils. Does that clarify and help? Between 1971 and 2014 Philip Eden maintained a separate record of CET with the aim of more faithfully representing and continuing the record developed by Gordon Manley from 1659 up to 1971. Instead of the 3 sites used by the Met Office , Philip Eden used 2 sites in Oxfordshire and Lancashire to be analagous to that developed by Manley. There are small differences between the Met Office and Philip Eden versions of occasionally up to 0.4C on an annual basis but an average of 0.03C annually. At 1200 km radius per site (4.5 million sq km @), only 113 standardized stations would be required to cover the whole globe (510 sq km). But ideally a range of elevations and distances from the sea would also be required for a meaningful average of the absolute temperate of the planet. Maybe someday such an automated network will exist. The North Pole is over water 4000 m deep. It beats me how you can ever hope to get a reliable “average” surface temperature for the globe given the huge range of conditions at the surface (elevation, prevailing winds, vegetation, humidity etc etc. That is why the only meaningful / reliable readings for the recent past and future are from the satellites. Let’s hope Trump does not throw the satellite baby out with the NASA GISS bathwater. UAH relies on state and other federal grants rather than NASA. Yes, but who funds the actual satellites? UAH and RSS are just academic bodies interpreting the data that comes from them. I think NASA launches and manages the satellites themselves. …and by average temperature I mean, of course, average temperature anomaly. I doubt any sane person would try and average absolute temperatures between the Gobi Desert and Antarctica! IPCC has disappeared the previous heat record of 136 F from Libya in the 1930s, and doesn’t recognize the new Antarctica record low of -136 F. But they average to zero F.
Quite! Perfect illustration of why that is nonsense. The alternative is to work out the change in the temperature over time (aka anomaly). And, as we all know, averaging that out over the whole globe is fraught with problems and probably has very little meaning. 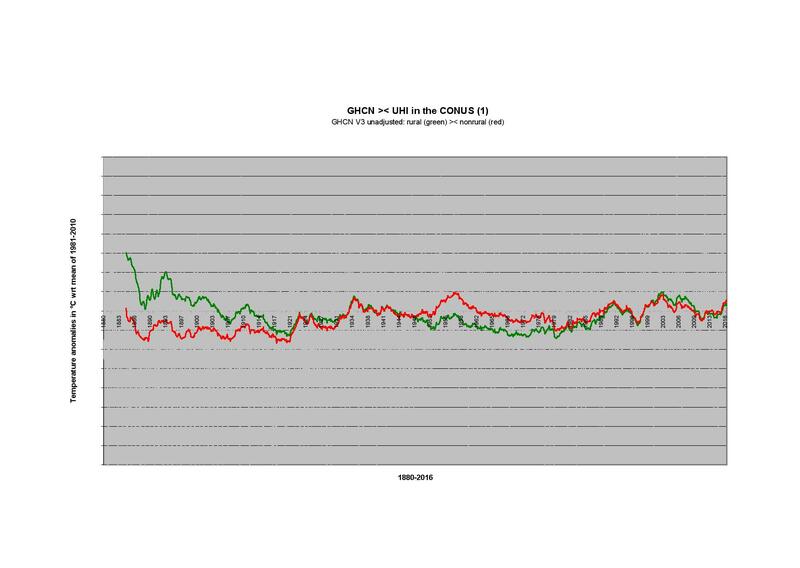 Is a change of 1c in the average annual temperature on Greenland from. say, -10c to -9c going to have the same impact as +15c to +16c in a temperate zone. Who knows? At the moment these changes get a geographical weighting but no weighting that reflects their impact on the world’s climate. The only exercise of any real value is to study different countries / regions / climate zones, see if temperatures are changing and what the effect is locally. Here in the UK we have warmed a bit, but not much and very difficult to discern any real impact on the way we live. Less snowy winters in the south, possibly, but that is no bad thing! In the Pacific NW of the US, the winters are not quite as cold as during the cold interval (despite rising CO2) 1940-77, but the summers aren’t any hotter. A human footprint outside of local land use changes is not detectable. The confounding of UHI and homogenization presents a sort of can-o-worms that people can argue about until the next ice age sneaks up on us all. Some years ago I read a PDF at a NOAA site file that summarized how USHCN data were adjusted for various affects, and besides being left with an impression of an inadequate treatment of UHI, I’d also swear that the process is one of homogenizing before correcting for UHI. I don’t think I have to say much about why this would lead to problems in final data. Now I suppose if a person believes that UHI has no effect on temperatures, as Griff claims above at 6:51 am, for the Berkeley Earth effort, then the order of corrections does not matter. But if UHI effects are that small there isn’t much point in correcting for them at all. Lately I have read several people on this site suggesting that a good measure of non-warming comes by way of a comparison of dates for record low and record high temperatures. I looked into this back on January 6th when the Laramie Airport Station (KLAR) reported -40F, but for days at NCEP the record low for the U.S. was listed as -13F at Wisdom, MT. I was puzzled and sent a request to NCEP (or NOAA) for information about how record temperatures were determined. I never got a reply, but many days later I saw that the record for the 6th had been revised to -48F at Walden, Co. There is a small note on the NCEP page that implies the record is selected from reports received as of 6 UTC on the date in question which implies in turn several problems with record temperatures: they have to be actively submitted, they are often from cooperative observers (you can read records that report location as one mile NW of Gunnison, or something like that); and, they must have time-of-day biases. There seems to be no surface records truly clean enough to speak credibly of record hot or cold, or to measure average earth temperature to the precision people claim. Hey – go argue with Berkley Earth. I am pretty sure I linked to a page which links to their findings on that. For the last two years I have been recording 3 CET-related temperature series from the Met Office website (to thenearest 0.1 degree), to see if I can replicate their figures and also detect their UHI adjustment. But Stonyhurst data are not available daily, so I have to use a nearby proxy. I expect my proxy to be slightly warmer, because it is south of Stonyhurst and also more likely to suffer from UHI. Therefore after they have subtracted 0.2 the official CET minus mine should be less than -0.2. The mean is 0.015 degrees (amazingly small really). This is not less than -0.2. As is explained by Berkeley Earth, UHI exists but is such a tiny phenomenon that it has no really perceptible effect on temperature, especially worlwide. (2) are indeed relatively small since 1979 (in blue you see in addition UAH6.0 for USA48 aka CONUS). And while the GHCN CONUS rural (349 stations) has a slightly negative linear trend (-0.04) when starting by 1880, its trend since 1979 (0.15 °C / decade) is higher than that for the nonrural rest (1493 stations, 0.11 °C / decade). Done a little data strangling of my own just now. 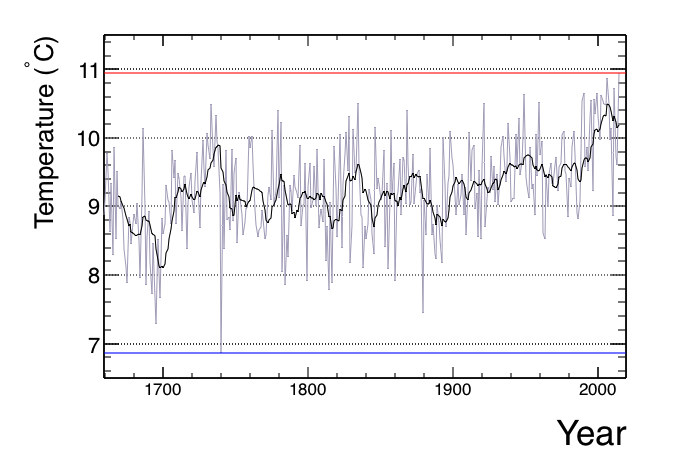 CET change since 1659 is roughly +0.0027c a year on average (a rate of 0.27c a century). 1950 to the present, covering the period when CO2 emissions have taken off, it has been rising at a rate of +0.0157c a year (+1.57c a century). 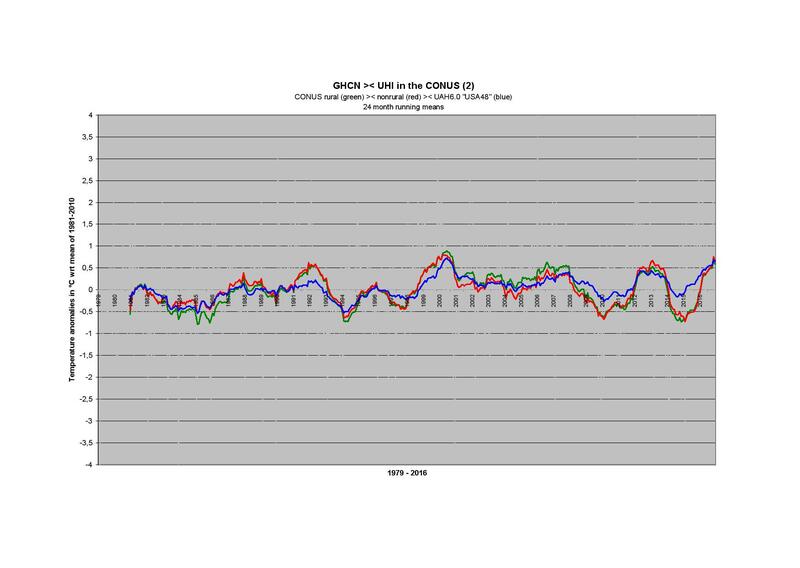 However, most surprisingly, during the first 16 years of the 21st Century the CET has been falling at a rate of -0.0209c a year (-2.09c a century) yep, national cooling! So the “pause” has definitely been a real event in Central England. So the “pause” has definitely been a real event in Central England. Certainly TLM… and by far no only there. Recently I computed the trends for all 7,280 GHCN stations from their respective beginning to their respective end. Your message motivates me to perform a global selection therein for 2000-2016. Here’s a terrible thought: Suppose a world war broke out that caused lots of bombs to go off in the fighting zones of the world, or worse, some really big weapons of mass destruction came into play. How would this affect our ability to trust global average temperature at all ? A radical idea might be to admit that a number simply does NOT exist to gauge any such measure. The only sure way we know that the globe was heating abnormally would be if most of its surface experienced a simultaneous huge increase in temperature. I often wonder what effect the many burning cities 1939-45 might have had on climate -much smoke and soot. Got to be something like a volcano in terms of scale of effect???? Anyone know if anybody ever looked at that? Of course it has been studied, and results misused by “nuclear winter” polemicists like the astronomical Dr. Sagan.